Anuraga Palace, A Treehouse Palace Hotel Ranthambore is the finest luxury palace hotel in Ranthambhore, This five star resort located at ranthambore Road where the solitary roar of the tiger echoes in the splendid foothills of the Aravalli Mountain. You can imagine the world of Anuraga , A Treehouse Palace Hotel Ranthambore where tradition meets modernity. 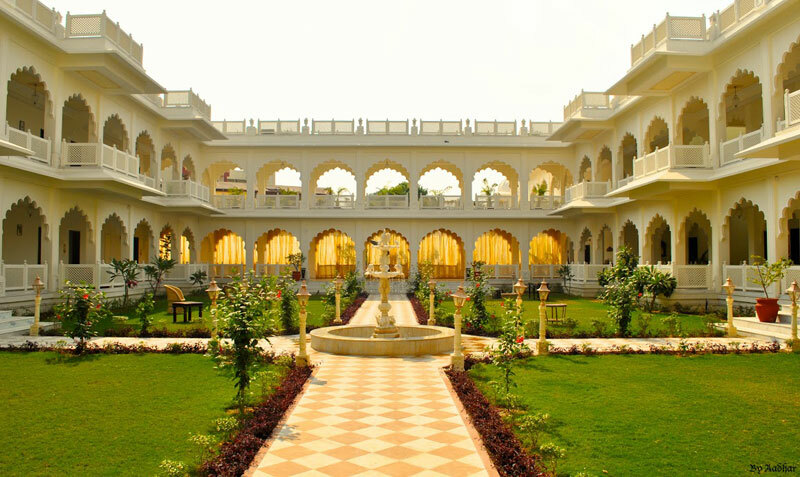 Hotel Anuraga Palace has Engraved in adoring details, in the antiquated white architectural style of a conventional Rajasthani haveli style. Hotel provides the best of hodiernal amenities for the leisure and business traveler. The hotel offers excellent accommodation, breath-taking themes at the lobby, overlooking luxuriant lush green sprawling lawn, Conference hall, where guest making it one of the ultimate paregoric resort in Ranthambore. Swimming pool in the hotel makes an amiable atmosphere. Anuraga Palace, A Treehouse Palace Hotel in Ranthambore disports a lot of the tribal mastership patterns. The resort will prepare flashback that lingers in your mind for a long time. Anuraga Palace, A Treehouse Palace Hotel in Ranthambore offers a wide range of accommodation. There are 40 spacious deluxe and premier rooms, and 4 luxurious theme suites which make it one of the leading luxury hotels in Ranthambore. All rooms are well nominative with contemporary facilities such as attached bathroom, air conditioned and writing table with chair, satellite TV, hair dryer, hot and cold running water and slippers. All room has its own individual style with flora pattern. Each room is using flower-patterned designs on the ceilings and walls. Anuraga Palace has beautiful multi cuisine dining named “Basant” – Basant means spring in India that offers delicious food in it’s a spacious dining area. The Multi cuisine restaurant Basant serves a variety of dishes with Indian, continental and Chinese recopies. The Treehouse Anuraga Palace is the finest place for relax and discover wildlife in Ranthambore Tiger Reserve.